The Gray or Grey Kingbird (Tyrannus dominicensis) - also known as Pitirre or White-breasted Kingbird - is a widespread Tyrant Flycatcher that occurs naturally in the Caribbean. Their numbers appear to be increasing in Florida and other parts of southeastern United States. 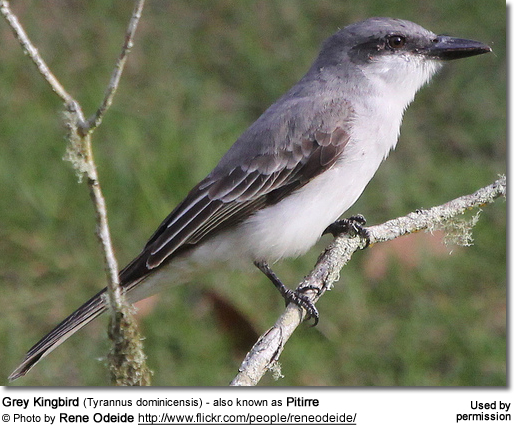 The Grey Kingbird is mostly found in southeastern USA south to Central America. In the United States, they breed along the Atlantic Coast up to Fort Caswell in North Carolina; and along the Gulf Coast to Biloxi, Mississippi. There are some records of them having travelled up the Atlantic coast to New England (the northeastern corner of the United States). 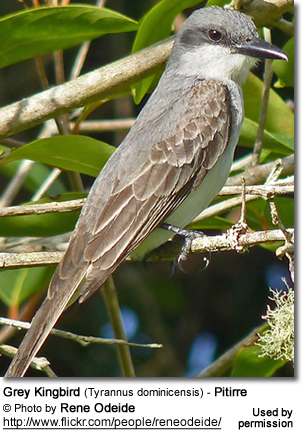 In Florida, the Grey Kingbird was historically restricted to the coastal areas; however, they are now increasingly found inland. During the summers, they are quite common in southern Florida; its numbers decrease toward the north. Central / South America: Its range includes Cuba down to Puerto Rico; eastward across the Lesser West Indies, south to Venezuela, Trinidad, Tobago the Guiana and Colombia. Its northern populations are migratory; traveling along the Caribbean coast from the Yucatán Peninsula of Mexico south to its wintering range in the southern Caribbean and northern South America. Its breeding range includes the coastal areas of South Carolina, Georgia, Florida, the West Indies, as well as various smaller islands in the Caribbean. They winter from the Greater Antilles south to Colombia, Venezuela, and the Guianas. Found in southeastern USA (southeastern North Carolina, Georgia, and southeastern Mississippi to Florida), Bahamas and Greater Antilles. Isolated populations also exist in north-central Venezuela (south to Apure), Trinidad and Tobago, Curaçao, Bonaire, and possibly northern Colombia; winters from Panama south to central Colombia and south and eastern Venezuela. Found in the Lesser Antilles (a chain of 15 major and myriad smaller volcanic islands extending north and north-west of Trinidad and enclosing the Caribbean Sea). 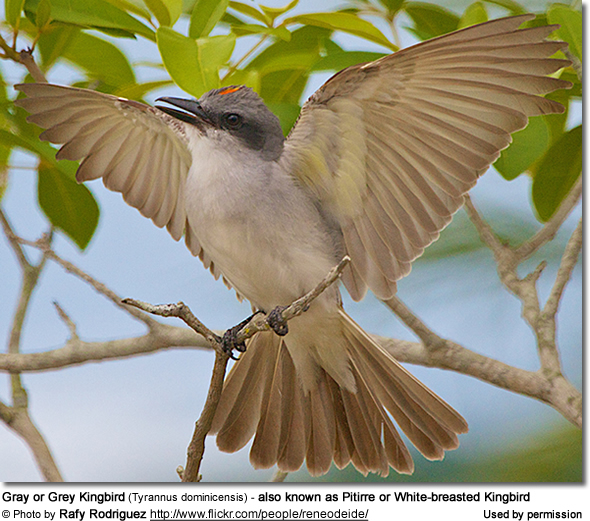 The Grey Kingbirds are commonly seen in the mangrove swamps of south Florida and the Caribbean region. They are usually found in areas with tall trees and shrubs, groves of palms and oaks, along the edges of savanna and marshes and in coastal areas. In the West Indies, their habitats are mostly open and dry, but they typically remain close to water. The Grey Kingbird is a large, vocal and conspicuous bird that is typically seen perching on an exposed branch with a large visibility range as it searches for flying insects to catch mid-air. During the breeding season in particular, this fearless species is known for their territorial behavior and displays aggression toward other Grey Kingbirds, other bird species (even larger than themselves, such as caracaras, hawks and crows) and they are often observed harassing mammals, such as cats, dogs or humans that are close to their nests. This phenomenon resulted in the widespread adoption of the pitirre as a nationalist symbol in Puerto Rico and for the Puerto Rican independence movement. Its crude cup nest is constructed of twigs, grasses, rootlets and lined with finer grass, down and animal hair. It is often build nest near human habitations in a tree. The typical clutch consists of two cream-colored eggs with reddish-brown marks. The eggs are incubated by the female alone. 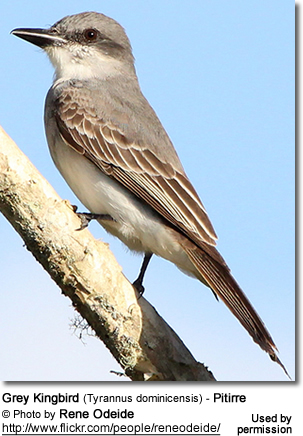 The adult Gray Kingbird is a stocky, large-headed, pale grey flycatcher. It measures, on average; 9 inches or 23 cm in length. However, their length ranges between 8.7 - 9.9 inches - 22 - 25 cm. They weighs about 1.7 oz or 47 g.
It has a heavy, black bill with a slightly hooked upper beak. The adult upper plumage is grey. There is an orangey-reddish streak on the crown (top of the head); however, it is not always visible. One of this bird? 's most distinguishing characteristics is the dusky blackish patch through eye that resembles a mask. The under plumage is mostly pale / white with a grey tinge to the chest. The wings are brownish, as is the dark and slightly forked tail. Juveniles have rufous edging on their wing feathers, rump and tail. 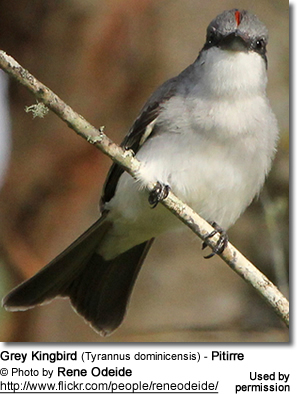 The Grey Kingbird resembles the Eastern Kingbird, but can be differentiated by its forked tail. It also lacks the white terminal tail band. It can also be confused with the Loggerhead Kingbird, that it has a dark head and lacks the dark cheeks of the Grey Kingbird. 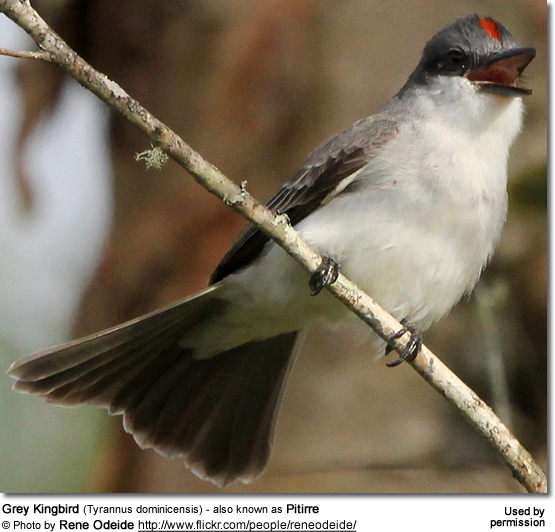 Its call is described as a high-pitched, harsh and loud rolling trill, pipiri pipiri or ?pitirre, which led to its local names pestigre or pitirre, in the Greater Antilles, or "petchary" in some of the English-speaking regions..
Its vocalizations are often heard as it perches on exposed branches or telephone wires ready to chase after flying insects. 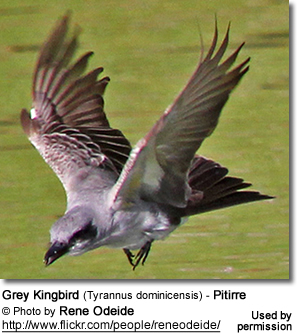 Grey Kingbirds mostly feed on insects, such as bees, wasps, beetles and dragonflies. They also eat small lizards. Depending on the season and availability, small fruits and berries make up as much as one fifth of their daily diet. Scientists observed a Loggerhead Kingbird capturing five small crabs on a beach in the Bahamas. The Kingbird captured the crab on the ground and returned to its perch. It then struck the crab repeatedly against the branch and then swallowed it. This kingbird caught several crabs afterwards displaying the same behavior. Lefebore and Spahn also observed unusual feeding behavior in Spain, where kingbirds were capturing small fish. Lefebore and Spahn (1987) and Wunderle (1981), therefore, suggest that "island flycatchers and kingbirds may broaden their diet opportunitistically by using typical foraging behavior to capture novel prey." Rene Odeide also observed some behavior that is unusual in this species. He noticed that they appeared to be foraging for food in a lake, which supports the above findings that this species may also be adapting its feeding habits to a changing environment. He also saw them expelling something from their bills, which could be the indigestible parts of insects or other food items.